You're not pessimistic! You just know that engagement ring doesn't mean a thing until the real McCoy is on your finger and he says, "I do." Live your storybook life with the Kate Spade New York™ Bride Idiom Bangle. Outside engraving: "cue the confetti, cheers, kiss the bride, tie the knot, toss the bouquet, cut the cake." Inside engraving: "happily ever after." 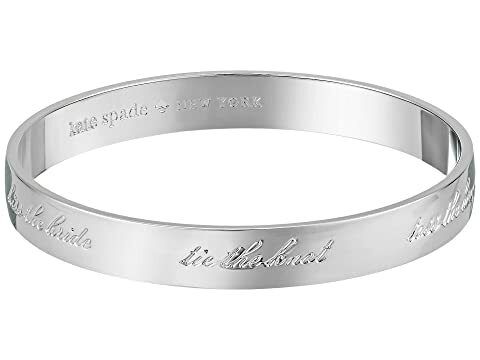 We can't currently find any similar items for the Bride Idiom Bangle by Kate Spade New York. Sorry! Purchased for my sister’s bridal shower. She loves it! My friend who is getting married loved it! Great gift. makes for a perfect gift for a close friend getting married.